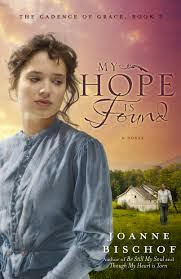 I was able to read My hope is found by Joanne Bischof, Through Blogging for books. I had not read the first 2 book that go along with this so I was hesitant at first to give it a try.I had seen it available on blogging for books but its been my experience that when you do not read most books in order you have a hard time getting into it. This was NOT the case with My hope is found by Joanne Bischof. First I did love the story is was great Christian fiction, second I liked that even though she did some re-caping I did not feel like it was to much or to little. People who have read the first 2 will not have to plod through lengthy re caps and at the same time those of use who did not read the first 2 will still get enough background info to enjoy coming in late to the story. The basics of this book is about Gideon and Lonnie who were married and had a child . all was good until a woman from Gideon's past coves forward and says she is his rightful wife. Lonnie and Gideon have to part ways and that where this book comes in. I am not going to give away more of the story because it would spoil it for you. I think its a very nice and well written story that your sure to like.